…it is an odd fact about our chosen trade and quite ironic that we engage in long hours of being alone, in order to connect with others. I would like to say, I will give it my very best. As I mentioned, I now live in Vienna, Austria where I have been living for a total of over 16 years. This may explain the accent and the reason why I always started off the program-wide chats with “Good morning,” because, Dr. Wendland, 9 pm Greensburg time is 3 am Vienna time. Vienna has become a second home to me and I love it there. It has centuries of stories to tell. In the first district in the middle of the city is St. Stephan’s cathedral – Vienna’s most beloved landmark. 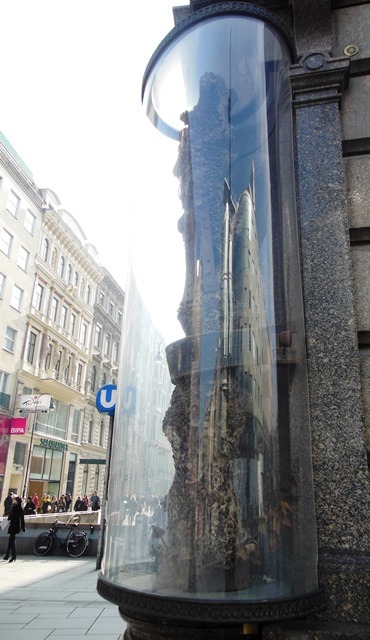 And about 100 steps from the cathedral’s doors is a glass case at a place called Stock-im -Eisen. No one ever stops to look at it. I doubt you would even find it in the travel guides. It’s in a pedestrian zone. A busy thoroughfare of shoppers and tourists bustle past every day at every hour. But it is there snuggled up next to a building on the corner. But if you really look, you will see what stands inside the glass case. It is a dark-colored mid-section of a tree-trunk about 7 feet tall and 10 inches wide which dates back to the middle ages. It is held up by an iron band that bears the date 1575 with the initials of the guy who put it there. And if you strain your eyes even more, you will see many metal things sticking into that tree. The Viennese call it the Nagelbaum, or nail tree. It is called that because it bears hundreds of nails, the first one was pounded in about 1440. Think about that for a minute – 1440. Now a bunch of us here today are writers not mathematicians so I’ll do the math for you quickly – that’s 573 years ago. Five hundred and seventy three years! Just imagine the class of 2013 abandoning the cheese platters and lemonade after this ceremony to race to the front of Cecilian Hall and pound our pencils, our pens, our iPads into Sister Charity’s oak tree to the rhythm of Professor Arzen’s devious laughter claiming, “I always knew those WPFers were bad news! This wouldn’t have happened with literary students”. Then in the year 2586 – 573 years from now – our sci fi writers could describe it better – some SHU grads zooming around the quad discover that tree with those items. Besides Prof Arzen’s Schadenfreude and the fact that Prof. Wendland would be in some serious trouble, think about it. What would provoke someone to do such a thing? Many someones. For centuries! Many legends surround the tree – stories like the kinds that we like to write here – fantasies about a magical grove that gave birth to the city, romances about a young man trying to win the favor of a beautiful maiden and even horror stories about punishment and the devil. But one story in particular comes to mind when I think of our ceremony here today and the path we started several years ago here at SHU. This is the tale of the Nail Tree in Vienna and craftsmen embarking on their Walz. You see, in the past, the Craftsmen Guild of Europe in the middle ages required their members to travel to become a master. Young men wanting to be stonemasons, carpenters, roofers or furniture-makers left home 2 -3 years to work under the supervision of a master of his chosen craft to perform at first menial work for very little money. And you thought the one week residencies were long? But the menial work for very little money sounds vaguely familiar to the writers amongst us, doesn’t it? But it’s not the money I want to talk about, it’s the journey — the path to become a master and the four important groups who accompany us on the way. Now the first is perhaps the most obvious – those masters already practicing the trade. That is who the craftsmen set out to learn from. Walking – they were required to walks weeks – at least 50 km from their homes — to get to a village with a master craftsman, from whom they could learn their trade. Not unlike those of us here today. Traveling from all corners of the United States, all corners of the globe, to come under the direction of these masters sitting before you – men and women who know their trade – who have pitched to agents, negotiated contracts, debated with editors and gracefully ignored negative reviews they have done it all and… they have learned to become better writers and masters of their craft and have taken us under their wings to share their expertise so we may do the same. They’ve helped us to purge all adverbs, pick up the pace, and push forward. They look unassuming and yet – they are the masters amongst us. Now the second group of our journey are those we knew before embarking on our journey, the ones we leave behind – family and friends. In the middle ages, someone who was married, could not go on the Walz. The fellow – and it had to be a fellow – had to be under the age of thirty and single and have accumulated no debt. I think that last point there has just about disqualified about every single one of us graduates. But I think the real point is that they had to leave everything behind and go out into the world. And we too have left many of you behind. Quite literally when we boarded the planes to come here to Seton Hill every 6 months. But our passion for writing has demanded that we leave you time and time again in other ways as well. Whether that be by entering the next room and closing the door to edit a draft or by zoning out for a few minutes to our own little made up worlds of people and dialogues. We have left you to emerge ourselves in long periods of self-inflicted isolation. And you, through virtue of your presence here today, continue to demonstrate your support of our journey and I think I can speak on behalf of my fellow graduates and say that we thank you and are very grateful. Because I am also convinced there is a good reason these fellows had to be single – and that is because it is hard to be attached to someone on such a journey. And so we thank you for helping to make this possible. And it is an odd fact about our chosen trade and quite ironic that we engage in long hours of being alone, in order to connect with others. There is a saying about Viennese coffeehouses – they are places where people like to go to be alone in the company of others and I think this is true about the writing community and the connections we’ve made at Seton Hill. Which brings me to the third important group in our journey. Now I joked about the encouraging email from my Mantasy writer critique partner stating, “Don’t screw this up.” Though he writes thrillers and loves ninjas and I write historical fiction and love horse-drawn carriages, we share a love of great storytelling. And we share this love with every single person graduating today and all those who will graduate tomorrow. And there is nothing quite so refreshing along the long hard road on a chosen journey as meeting a fellow traveler – the campfire burning and waiting for our arrival – surrounded by others who are weary with travel but eager and willing to share tips, advice and encouragement to keep us moving along our paths. Perhaps best described by a Seton Hill student who answered a question posed by the infamous Bill Braddock on our Facebook group. The question was, “What from Seton Hill has given you the most mileage?” And one person answered, “when that lightbulb went off and I realized, ‘Oh, these are my people. I’ve finally found them.’” The same people who cheer for Bill when he gets a contract, CBS buys his script and has it made into a series and Permuted Press publishes his novel. And who, when someone else in our FB group posts in desperation that they have received a bad review falsely accusing of them of plagiarism – within seconds respond: “For the love of God, don’t respond.” Or when another shares the news of a rejected query letter – and sadly – everyone here will go through that – 20 some folks respond to the message, “Send out the next ones RIGHT NOW”. Because as one of the speakers reminded us yesterday, no matter who we are in this field, there will be those disappointing moments. In the end, what will determine that difference? I am not sure. I am not yet published though several people in the graduating class before you here today are. I suppose luck is important. 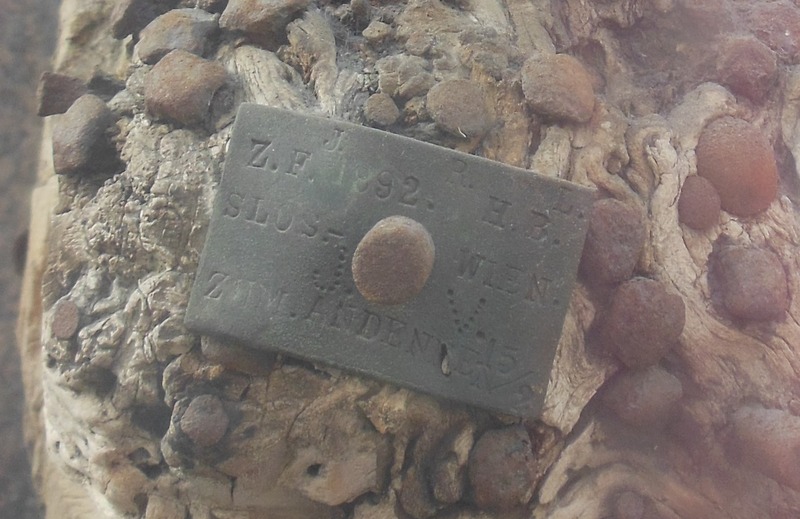 If we take a good look at that tree trunk in the middle of Vienna, you will see what makes it so incredible – hundreds of nails from every century since 1440 pounded into that trunk – the last one a nail from the workers of the subway that runs directly below the square. And those craftsmen pounded in those nails – an object of great value hundreds of years ago – for luck before they left on their journey. And we too will need a lot of luck to continue. Luck combined with patience, persistence and perseverance. Because let’s face it. If you have participated in this program with your ears and heart open, and a willingness to embrace critique, work hard and improve, then you will have written a manuscript worthy of publication. So it will come down to what we are made of and how much we want this. And in times of doubt and desperation we may weaken and start to listen too earnestly to those who say that it is just art and has no value. But I want you to always think back to that tree trunk on Stock-im-Eisen. And if you ever think about seriously giving up, come visit and we will go look at it together. Because most commencement speeches will advise you to make the most of this life while you are here. But art will allow us, every one of us, to do even more. With art, we will not just communicate to the person in the next room, across the street or in another time zone, with art, we can communicate with people in a whole other time — tomorrow, next week, two months from now, five hundred and seventy three years from now. Our Masters that we take home today will probably not enable us to buy a bigger house or fancier car. But it is proof. Proof that we embarked on a journey to become better at what we do. We have followed a long tradition of people willing to leave the safe warmth of their four walls to venture into a scary and uncertain world. And we have done so all in the name of art. Art that may not span the great divide between poverty and wealth but will have the ability to span the even greater divide of life and death. And given that writers are judged by their worst work while living and their best when dead, the future can only get brighter. And so in closing, we, the class of 2013, want to thank all of you for giving us the time and space to write and become masters of our trade. Giving us the time and space, mentoring and support to embark on this journey. And most of all for believing in us and for believing in our art. May our journey to write better books and become masters of our trade never end.